Truth be told, cycling is just about as dangerous as off-road biking, if not more dangerous. Cyclists encounter all kinds of dangers all the time in the form of pedestrians, unforeseen and unseen obstacles, and other vehicles. It is for these reasons that the cyclist must get important accessories which are essential for his safety and well-being. As a matter of fact, some of these accessories are required by law; meaning, without them, you can land yourself in trouble with the police. But, the question is: which accessories should you buy? This is a very timely question in the sense that the market is teeming with biking and cycling accessories. 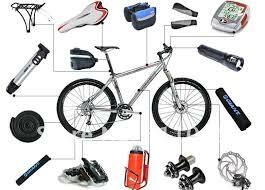 Which of these accessories is critical and which are not has become quite a dilemma for some cyclists. The first important item that you need to get is the helmet. As we have established earlier, traffic rules in all states in the country require that cyclists and motorists wear federally checked helmets whenever they are on the main roads. But, why are helmets important? Well, in an accident, the most prone area of your body is your head. You need to protect your head at all times because a forceful blow to it can immobilize you or even kill you. A government-approved helmet can offer this sort of protection. It must also be understood that there are different kinds of helmets for different kinds of needs. For instance, if you are a downhill biker, then you need a full mask. On the other hand, cyclists only need helmets which are aerodynamic and effective (at protecting your head). The attire that you wear is definitely as important as the helmet. Clothing in cycling is not just a fashion statement. It is not worn to ride with the fad. Indeed, of utmost importance is the effectiveness of the said attire in protecting your body from injury. What are the different factors that need to be considered in choosing the right clothing for cycling? First, it should have bright colors. This would make you easily visible to traffic. Dark colors are fine provided that you are sure that you will not be on the road when it becomes dark. Of course, common sense would tell you that dark attire at night is dangerous because it makes you less visible to traffic, and this makes you prone to all kinds of road accidents. Basically, the best clothing colors are those which are reflective or luminous. Reflective coloring includes those light green, yellow, or orange lights that reflect incoming light. This does not make you only visible, but it also makes you stand out from the road. Some cyclists make use of leather for their clothing. Leather is excellent at protecting your body from scratches and nasty wounds in an event of an accident. However, this might be a little far-fetched. More often than not, cyclists prefer clothes which are both safe and comfortable. Leather is heavy; thus, it is very unsuited for cycling. For long range cycling, repair kits are a must. Repair kits can mean life and death, especially if you constantly do long range rides. The most common repair kits include screw drivers of assorted sizes, and tire rupture repair kit including a tire pump and an extra interior. The chances of accidents involving cycling are pretty low, especially if you have top-of-the-line bikes. However, this does not mean that you will not be in one. It is still best to prepare for the worst. Of course, one must constantly hydrate if cycling. After all, cycling is an excellent form of exercise because you can lose a few pounds in just a single day! However, this also means that you are at risk of being dehydrated, especially if you are mostly out under the heat of the sun. Having one bottle may not be enough. In fact, having two will not always do the trick. It is best to always have a backup water bottle. Lights are considered by many to be mere luxury accessories. This is very far from the truth. Lights are critical accessories that a cycling bike must have. The lights are not really for your comfort, or for you to be able to see properly. In fact, the head light of a hybrid or road bike does not really give off much light. The purpose of the light is to make sure that you are visible on the road. It can mean a matter of life and death. Of course, having security locks is just as important as the others. Bikes are very light these days and they can be carried around easily. Unlike your car bikes do not need keys; they can be used by just about anybody anytime. Therefore, you need to have a decent lock which would make your bike almost theft-proof. Hope this list makes you think again about what you need for your next ride! Posted in Buyers Guide on May 19, 2014 by Rich.